If you’d asked farmers a few hundred years ago what skills their kids would need to thrive, it wouldn’t have taken long to answer. They’d need to know how to milk a cow or plant a field. General skills for a single profession that only changed slowly—and this is how it was for most humans through history. But in the last few centuries? Not so much. Each generation, and even within generations, we see some jobs largely disappear, while other ones pop up. Machines have automated much of manufacturing, for example, and they’ll automate even more soon. But as manufacturing jobs decline, they’ve been replaced by other once unimaginable professions like bloggers, coders, dog walkers, or pro gamers. In a world where these labor cycles are accelerating, the question is: What skills do we teach the next generation so they can keep pace? More and more research shows that current curriculums, which teach siloed subject matter and specific vocational training, are not preparing students to succeed in the 21st century; a time of technological acceleration, market volatility, and uncertainty. To address this, some schools have started teaching coding and other skills relevant to the technologies of today. But technology is changing so quickly that these new skills may not be relevant by the time students enter the job market. Not only is it difficult to predict what careers will exist in the future, it is equally uncertain which technology-based skills will be viable 5 or 10 years from now, as Brett Schilke, director of impact and youth engagement at Singularity University, noted in a recent interview. So, what do we teach? Finland recently shifted its national curriculum to a new model called the “phenomenon-based” approach. By 2020, the country will replace traditional classroom subjects with a topical approach highlighting the four Cs—communication, creativity, critical thinking, and collaboration. These four skills “are central to working in teams, and a reflection of the ‘hyperconnected’ world we live in today,” Singularity Hub editor-in-chief David Hill recently wrote. Hill notes the four Cs directly correspond to the skills needed to be a successful 21st century entrepreneur—when accelerating change means the jobs we’re educating for today may not exist tomorrow. Finland’s approach reflects an important transition away from the antiquated model used in most US institutions—a model created for a slower, more stable labor market and economy that no longer exists. In addition to the four Cs, successful entrepreneurs across the globe are demonstrating three additional soft skills that can be integrated into the classroom—adaptability, resiliency and grit, and a mindset of continuous learning. These skills can equip students to be problem-solvers, inventive thinkers, and adaptive to the fast-paced change they are bound to encounter. In a world of uncertainty, the only constant is the ability to adapt, pivot, and get back on your feet. Like Finland, the city of Buenos Aires is embracing change. The idea is to teach students to be adaptive and equip them with skills that will be highly transferable in whatever reality they may face once out of school, Bullrich explains. Embedding these entrepreneurial skills in education will enable future leaders to move smoothly with the pace of technology. In fact, Mariano Mayer, director of entrepreneurship for the city of Buenos Aires, believes these soft skills will be valued most highly in future labor markets. This message is consistent with research highlighted in a World Economic Forum and Boston Consulting Group report titled, New Vision for Education: Unlocking the Potential of Technology. The report breaks out the core 21st-century skills into three key categories—foundational literacies, competencies, and character qualities—with lifelong learning as a proficiency encompassing these categories. This continuous learning approach, in contrast to degree-oriented education, represents an important shift that is desperately needed in education. It also reflects the demands of the labor market—where lifelong learning and skill development are what keep an individual competitive, agile, and valued. Transitioning the focus of education from degree-oriented to continuous learning holds obvious benefits for students. This shift in focus, however, will also support academic institutions sustain their value as education, at large, becomes increasingly democratized and decentralized. Any large change requires we overcome barriers. And in education, there are many—but one challenge, in particular, is fear of change. “The fear of change has made us fall behind in terms of advancement in innovation and human activities,” Bullrich says. 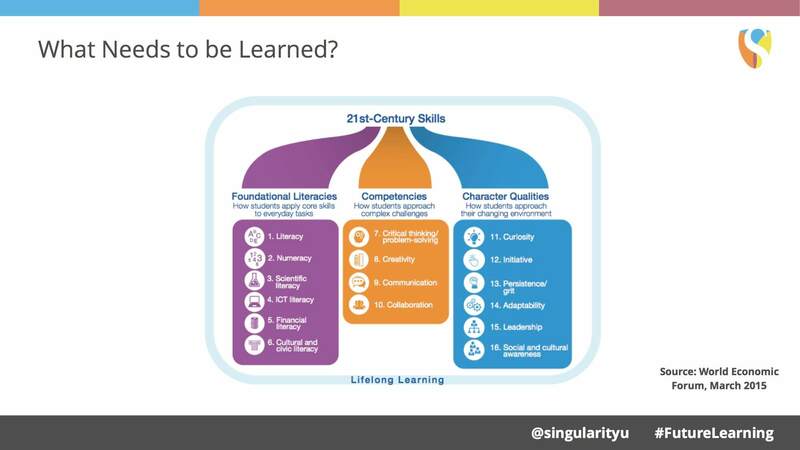 Education and learning are ready to be reinvented. It’s time we get to work.